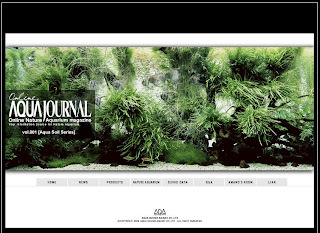 Aqua Design Amano has recently launched a brand new English website called Aqua Journal Online. The website contains tons of useful information, including articles on Aqua Soil (which seems to be the focus for this first "issue" of the website), setting up a new Nature Aquarium, and some galleries of Takashi Amano's tanks. One of the best features, available under Suikei Data, is the ability to look at Amano's tanks and then be able to see the tank data, including size, lighting, filtration, plants, and more. Some of the sections aren't finished yet, but it looks very promising and there's already enough reading to keep you busy for a few hours, so go check it out!